QUESTION: I heard that the Michigan legislature passed a law that requires employers to give employees paid sick time. I’d like to take some time off to have knee surgery, but I don’t know if I’m eligible, or how much time I could take. ANSWER: The new law, signed by Gov. Rick Snyder on December 13, requires some employers to give some employees up to 40 hours paid medical leave if the employee, or a member of the employee’s immediate family, is ill or requires treatment. But there’s a good chance the new law does not apply to you: The list of those who are not eligible under the law — a revision of the Earned Sick Time Act passed in September – is a long one. The law does not apply to you if you are an “exempt employee” (salaried); if you work at a business with fewer than 50 employees; if you are covered by a collective bargaining agreement (and are not a public employee); if you work less than 25 hours per week; if you work for a temp agency; if you are under 20 and work as a trainee/intern; or if you work for the U.S. government or another state – among other restrictions. If you are eligible, you can accrue paid medical leave at the rate of one hour for every 35 hours worked, up to 40 hours per year, but the time does not carry over from one year to the next. If your employer already gives you 40 hours of non-medical paid leave, the new law will not increase your total time off with pay. The law creates a “rebuttable presumption” that an employer is in compliance with the act “if the employer provides at least 40 hours of paid leave [vacation days, personal days, paid time off] to an eligible employee each benefit year.” Unlike other forms of paid leave, an employee will not receive any compensation for accrued paid medical leave if he or she leaves the employer before making use of the time. 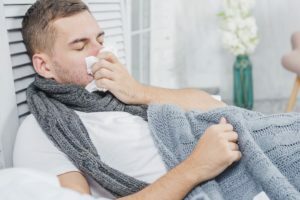 An employer who fails to provide medical leave may be fined up to $1,000.00, may be subject to penalties and may also be required to pay an employee for any paid medical leave that was improperly withheld. While you may not be eligible for paid medical leave, you might be eligible for up to 12 weeks of unpaid leave under the Family and Medical Leave Act, which applies to employers with 50 or more employees within 75 miles of their worksite. Employees must also meet several requirements before they are eligible for FMLA leave.